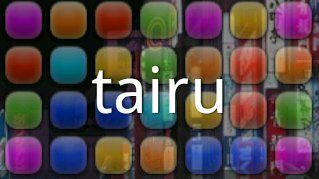 tairu is a game for android cell phones. The game board is an array of tiles, which you drag and slide to form rectangular patterns of matching colors. 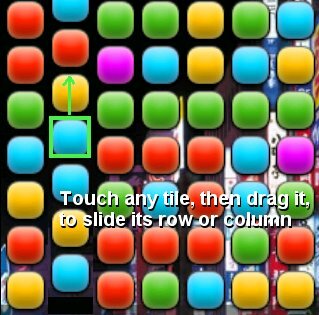 When you slide a tile (up/down/left/right) it moves all the tiles in that row or column. Tiles that go off one edge, come back around on the opposite edge. Try to complete your rectangles in as few moves as possible, as you have a limited number of moves. 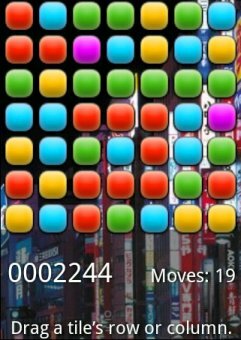 When you run out of moves, the game is over, but you earn extra moves for every rectangle removed! 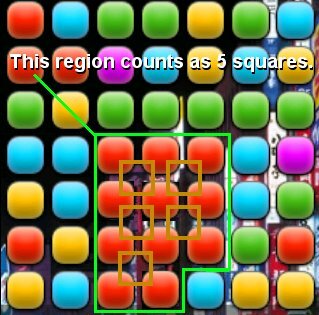 The smallest allowed rectangle is 2x2, but larger rectangles will earn higher points and more extra moves. Completed rectangles are removed from the board, with new tiles falling in from the top. 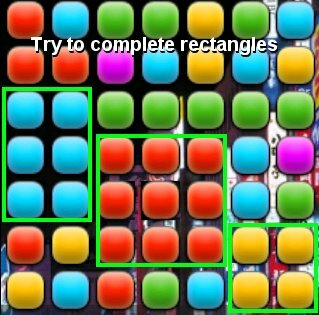 If those new tiles complete rectangles automatically, you will earn bonus points. You might notice extra tiles being removed, as all 2x2 rectangles are removed. After you have removed enough rectangles, you will earn a level, and subsequent point counts will be even greater! But higher levels unlock more tile colors, making the game more difficult! If you have problems or suggestions, please check out the tairu google group. For more information about Synthetic Reality, please see our home page.